Welcome to our page! 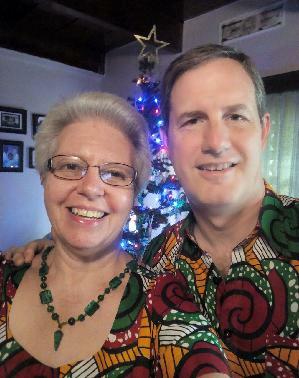 We are Mark Rich and Cynthia Holder Rich, Lecturers in Theology at Tumaini University Makumira, an institution of the Evangelical Lutheran Church in Tanzania. We’re grateful to see you here, and encourage you to use this page and the links below to explore opportunities to join us on this journey through prayer and financial support. Serving in ELCA Global Mission’s work in Leadership Development, we teach Systematic and Practical Theology to a diverse group of students who arrive on campus from Tanzania, other countries in East and Southern Africa, and across the globe. Makumira, one of five campuses in the Tumaini University system, is the largest Lutheran theological education institution on the African continent and a major university in Tanzania. The ELCT and Tumaini University have a goal for growth, seeking to help serve the nation’s and the region’s needs for education. We’re grateful to serve here at a time when ways to grow faithfully and coherently are being discerned. We have returned to mission service after serving in the US in a number of calls for nearly 20 years. Global mission, and how it is supported, have gone through major changes and shifts since we taught graduate theological students in Madagascar. We are grateful to accept this call at a time when both our churches -- ELCA and Presbyterian -- approach mission from a stance of "accompaniment", recognizing and lifting up the gifts of people of faith around the world, and engaging in mission at the invitation of our global partners in contexts where they have discerned needs. We invite you to walk with us on this journey of faith, learning and service, and to consider supporting us in a one-time, continuing, or annual gift to ELCA Global Mission, through the DONATE NOW link on the right side of this page. Gifts made through this page, combined with congregational covenants and budgeted funds, make our service possible. We invite you to join us through prayer, through following our journey, and through financial support. The growth of the community walking with us encourages us on the road. Thanks in advance for your gifts and for your willingness to join us on this journey. PS: Interested in more information about our ministries? Check out our blog, Mark and Cynthia in Tanzania, for lots of pictures, newsletters, and our reflections.